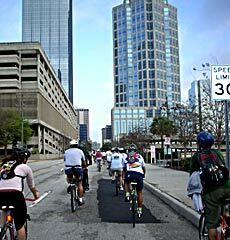 We are an informal bicycle club based in the Seminole Heights area of Tampa, FL. SHBC regularly plans 3 different ride types: a short, slow-paced ride that is kid-friendly; a moderately paced 10-mile+ ride and an 18-mile+ moderately paced ride; and our faster 15 to 30 mile rides which begin and end in Seminole Heights. Please visit our calendar for dates and times. We also hold an occasional special bicycle event that celebrates the Seminole Heights community. No fees or membership, ...just folks having fun. We ask that all participants have a safe, functioning bicycle when riding with the Club. If something needs attention, check out the Park Tools online bicycle repair database at http://www.parktool.com/repair/ for assistance, or bring your bike to your local bicycle shop. Be safe! Be sure to check out the club's Facebook page to stay up-to-date on all the latest happenings. OSHNA wants to hear from you! Problems with the site? Contact the webmaster here.